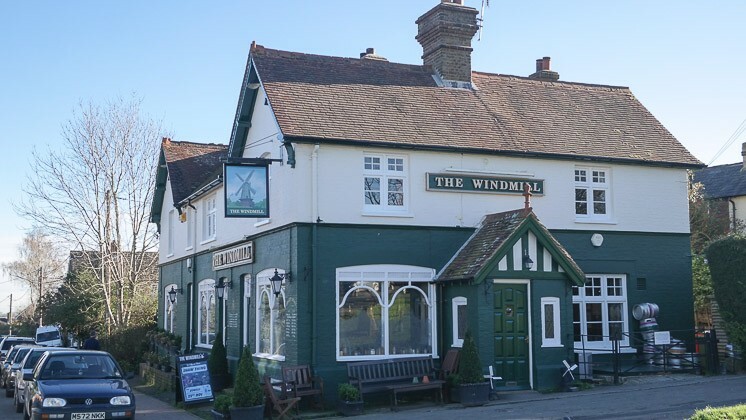 We were looking for a pub lunch rather than a restaurant one Sunday – after a bit of investigation, I found out and booked The Windmill in Sevenoaks Weald. This had to be by phone as they didn’t have a website! Parking was quite easy, there were a few spots long a nearby road – the pub was across the green (a very pleasant village, btw). We were met at the bar area and shown to our table. There were hops hanging, a wood burning stove in the corner and lots of beer related nicknacks dotted about – this was a “traditional” village pub. We were given some peanuts in a bowl to nibble on whilst waiting, and some water was brought to our table. Claire ordered a small glass of house wine; as there were so many beers available on tap, I asked for something a bit more unusual – an Adams Southwold Ale. As JW (our toddler) was being a bit restless, we decided to skip starters and go straight to the Sunday roast. We ordered 3 roast beef; some horseradish was brought over in a dish in preparation (I always like that). 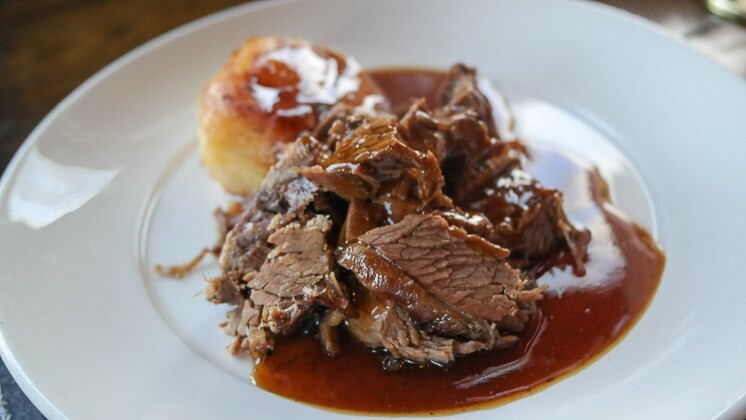 The food was served very quickly – only then did I realise we ordered slow roast beef brisket, receiving chunks of beef rather than slices. 3 roast potatoes, a Yorkshire pudding and gravy were on Claire’s and my plate, then a separate dish of kale, broccoli carrots and red cabbage. The beef tremendously tender but, in my opinion, not appropriate with horseradish. Claire disagreed with me on this point, she felt it really worked. The roast potatoes, whilst not crispy, were seasoned well and were fluffy inside. 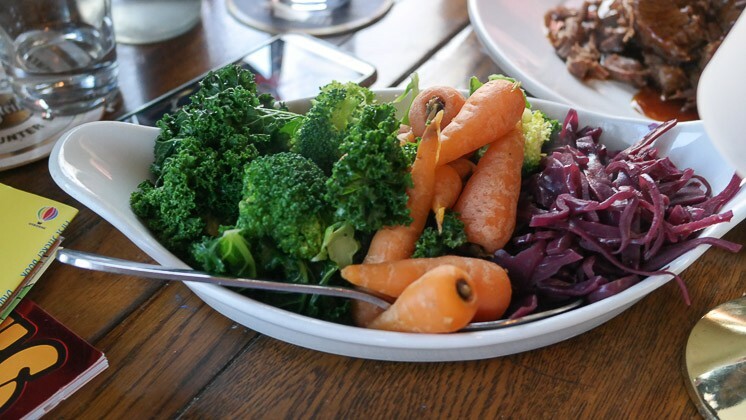 The vegetables seemed to have each been cooked separately, they tasted very good and I especially liked the red cabbage. Lastly, the gravy was thick, rich and flavoursome. Claire was being good this week, and unfortunately they were unable to provide something for JW’s dietary requirements (being gluten, wheat and dairy free) – we are now well practiced with this and had brought something with us for him. 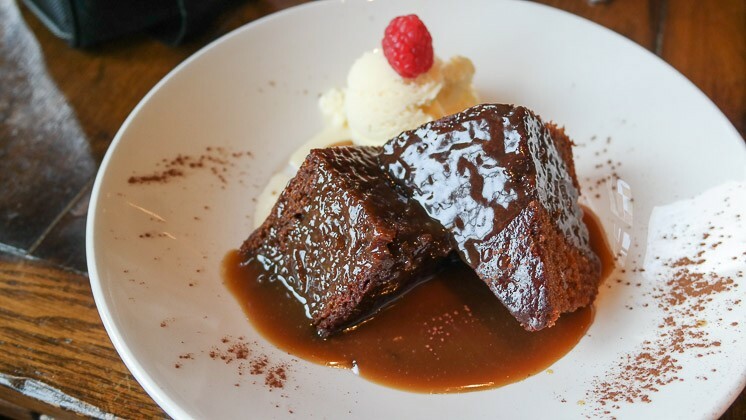 I decided to try the Sticky Ginger pudding with toffee sauce and ice cream. It was a very large portion, and tasted great! We didn’t need to use baby changing facilities so couldn’t comment on whether they were available. There were only 2 high chairs available, and both were being used, so JW had to sit next to Claire on the seat. He is getting older, so it’s not so much of a problem now but we did need to be very watchful due to the aforementioned nicknacks dotted around (being able to strap a child into a chair does make things quite a bit easier sometimes). The food portion was good for him, and they did offer children’s dessert, just that they weren’t suitable. Overall, a good place to take family for lunch, but perhaps try and request a highchair when booking if it’s required. 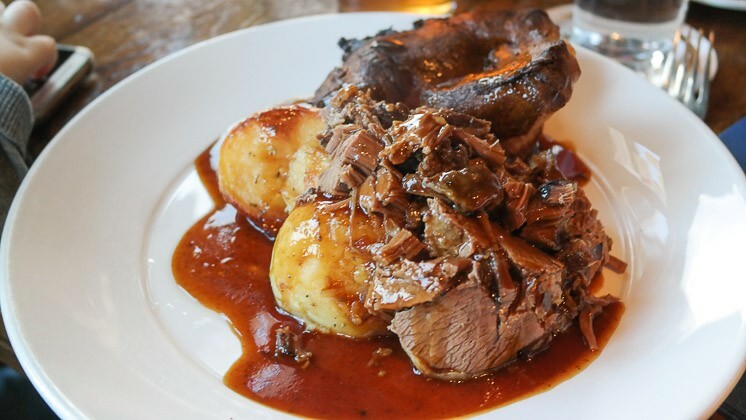 Sunday lunch at The Windmill was just what Claire was looking for – a village pub with good food. The service was friendly enough without being overbearing. The pub itself had a lot of character (as well as beers). The food was enjoyable enough, I was a bit disappointed that the beef was cooked that way but now knowing, I’d probably still order it again. A good vegetable selection and thick gravy made up for it. So, a strong effort from The Windmill – if you are in the area, go for a small family meal at lunch.